A garage with office space above is a common theme. The Original Twist version goes a few steps further with 6.6kWp of solar panels which constantly face the sun as the whole garage slowly rotates. Photovoltaic arrays perform some 20% better if they track the sun so the 22 panels perform as well as 26 static ones. 4 extra panels would cost £1,000 so tracking is worthwhile and of course it adds to the FITs return. A conventional array would have problems with the varying inputs across the panels but here each panel has its own micro-inverter which also enhances reliability and the performance reporting via wi-fi is fabulous. The rotation does more than just sun tracking though. With garage doors on both sides your car will be turned round and ready to be driven away again; a bonus feature where space is at a premium. 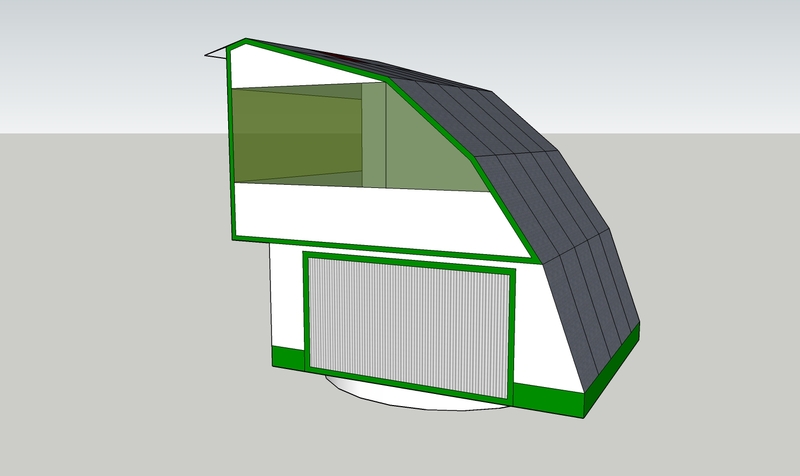 The height required by the PV panels gives room for a live/work space above. The space could be used as an office or even as an AirBnB pod with the added attraction of an ever changing view. Now the garage could not only power your house and charge your car but it could generate extra income in addition to the FITS return. The garage makes your electricity for your house and electric car but there may be another step to come. The hydrogen future is well in sight. The 300W panels together make a 6.6kWp array which is pretty punchy for domestic purposes and would leave a good surplus, even after charging the car. Power can be allocated for domestic use or for generating hydrogen via a simple electrolysis idea we all saw in the school science lab. A gadget like the SOLiC 200 makes sure that these demands are prioretised so that the demand of choice gets the first bite of the free power and other choices only run on surplus power. In this way all hydrogen production could be guaranteed to be free. To get into the vibe lets have a look at a day in the life of the Original Twist rotary garage. The car inside is a plug in E.V. with a hydrogen fuel cell range extender. It can autonomously park itself in the garage and automatically connect up to recharge the batteries and top up the hydrogen tank. The garage rotates to track the sun, of course, but it also turns the car round ready to collect you from your front door all heated and fueled up. A simple car that fuels itself automatically completely free of charge is certainly compelling. What future for smelly old petrol? Everything we have talked about is available right now so this is only made futuristic by the novel assembly of concepts. It’s certainly not too early to consider building your next garage on a turntable. While you could start off with a regular plug-in electric car the hydrogen versions will follow shortly. Check out the http://www.riversimple.com web site for a good example.